We all know how important brows are, brows help to define our entire face. Personally I like soft, but thick brows. 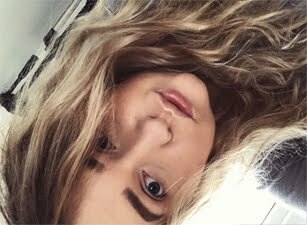 As my hair are naturally blonde, you can guess that my brows are quite fair, but luckily they are thick! My brows filling depends from what kind of look I would like achieve and how much time I have to actually do my make-up. Anastasia Beverly Hills is my favourite brand for brows, it's not the cheapest, but so worth it! 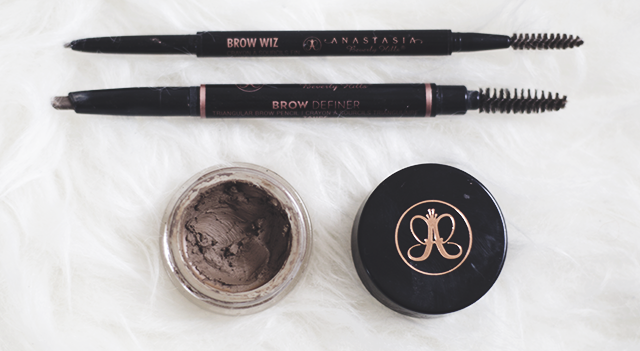 As I often ten to experiment with brow products, the Brow Wiz will forever be my number one. ABH is currently widely available in UK, you can purchase it from BeautyBay, CultBeauty, Net-A-Porter and others. Anastasia Beverly Hills Pomade in Taupe £15: The bestseller and I must say it's amazing! The Pomade does take slightly longer to fill your brows, as you need to have a steady hand, to create the perfect shade. Once it dries on your brows, it's waterproof, amazing for the hotter days. I must say that such a small pot lasts forever, also Taupe is perfect for blondes. Very highly pigmented, you can give your brows any shape with it, ideal for creating defined, natural-looking brows. Anastasia Beverly Hills Brow Wiz in Taupe £15.50: My all time favourite brow pencil, I think this is my 4th brow pencil, I love that at the end it has a brow brush, amazing for traveling or doing your brows on the go! Brow Wiz is an ultra fine pencil designed to shape, fill our brows. The ultra fine pencil allows you to create perfect brows without over filling them. For best results, use short upwards stroke in the direction of hair growth. Fill in any gaps and extend where necessary, making sure to blend with the brush for even, natural looking coverage. Anastasia Beverly Hills Brow Definer in Blonde £16: This is my least favourite brow product from ABH, the pencil is really thick, every time I use it my brows look really over drawn and that not the effect I personally like. As recommend you should outline with Brow Wiz, then use the wide end of the Brow Definer's triangular 'nib' to fill in gaps, before using the narrow end to create finer, hair-like strokes for a more natural effect. That's too much hassle in my opinion. I am not saying that it's a bad product, but personally it's not great for my brows. Out of the three products, Brow Wiz is my winner. I will forever re-purchase it, although NYX Mico Brow Pencil is extremely similar and it's half price. Have you tried anything from Anastasia Beverly Hills? What is your favourite brow product?